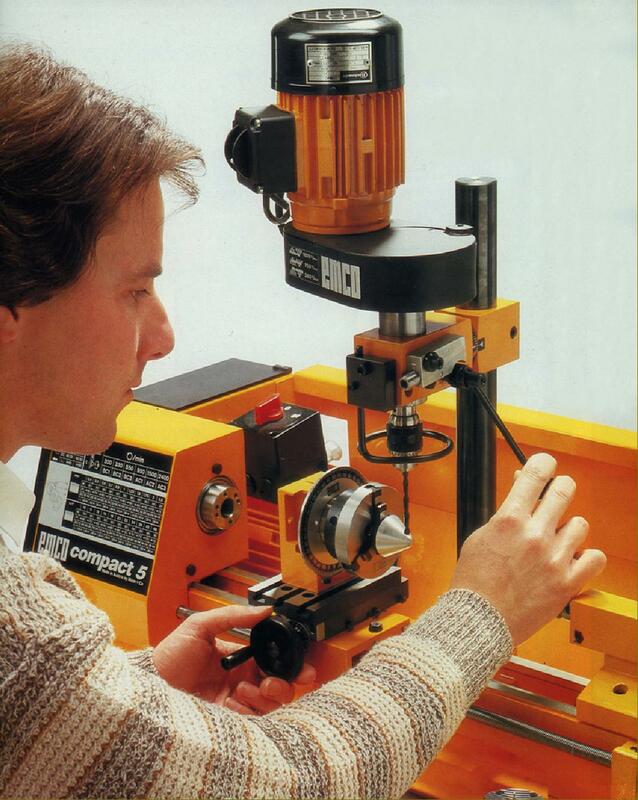 Compact 5 in basic form: capacity 2.56" x 13.78" (65 mm x 350 mm) with 6 spindle speeds from 200 to 2400 rpm. 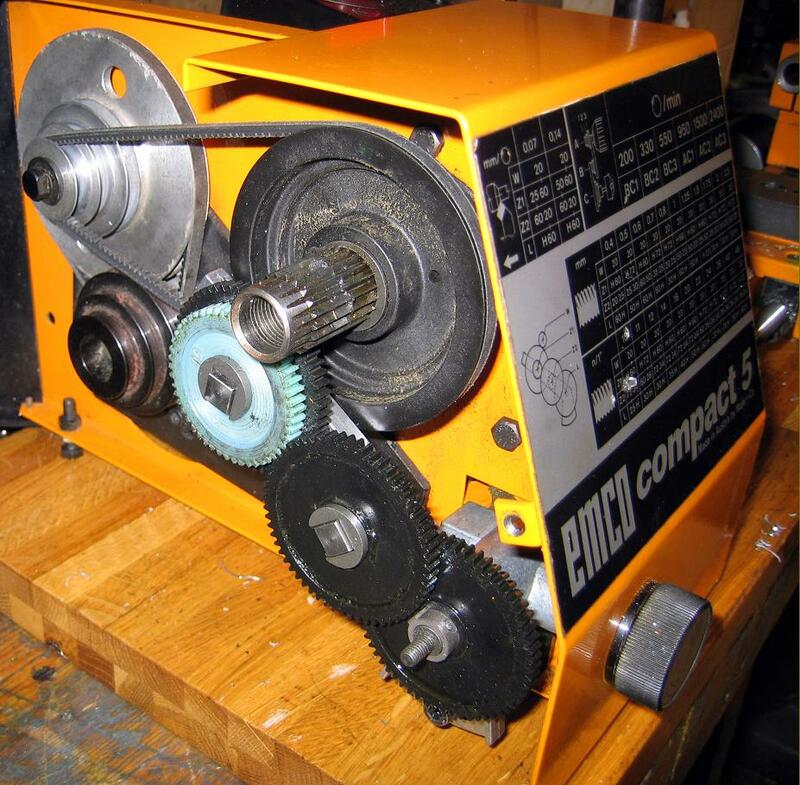 Long established and very popular, the Emco Compact 5 in its basic form does requires a number of accessories to turn it into a useful work tool - if you are looking at a used example the most import accessories are a swivelling top slide (often refered to as the "compound" and the automatic carriage-feed mechanism - a 2-speed device that included 6 changewheels and a push/pull engagement knob for the dog clutch. 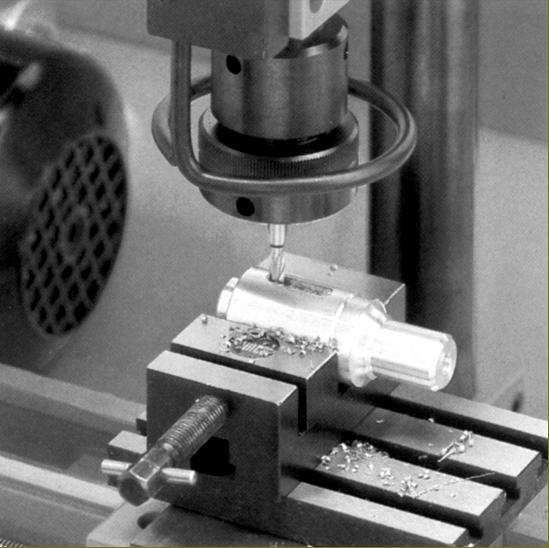 Using the unit gave two rates of fine longitudinal feed (0.07 mm (0.003")/rev and 0.14 mm (0.006")/rev and five metric thread pitches (0.4, 0.6, 1.0, 1.25 and 1.5 mm) - though only four (16, 20, 24 and 32 t.p.i.) on inch machines. 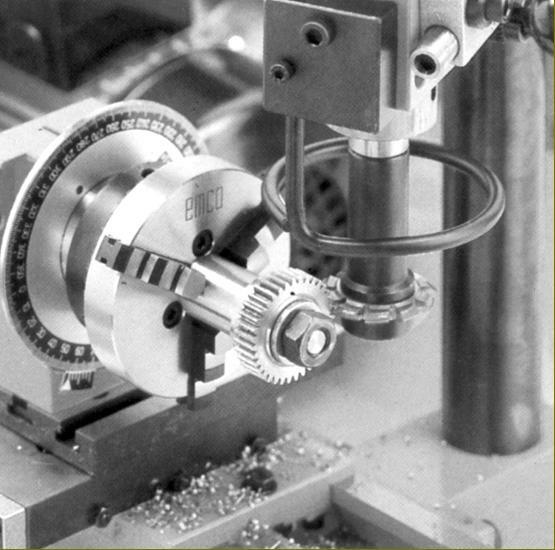 To make the screwcutting system complete a further set of 7 seven changewheels were offered that allowed, on metric lathes (with a 1.5 mm leadscrew), the generation 10 metric pitches from 0.25 to 2.5 mm and 14 inch pitches from 10 to 48 t.p.i. On inch models - the leadscrew was 16 t.p.i.) 13 pitches from 10 to 10 to 64 t.p.i. were provided together with 11 metric from 0.25 to 1.75 mm. Running in deep-groove, sealed-for-life ball bearings the headstock spindle was bored through 16 mm, had a No. 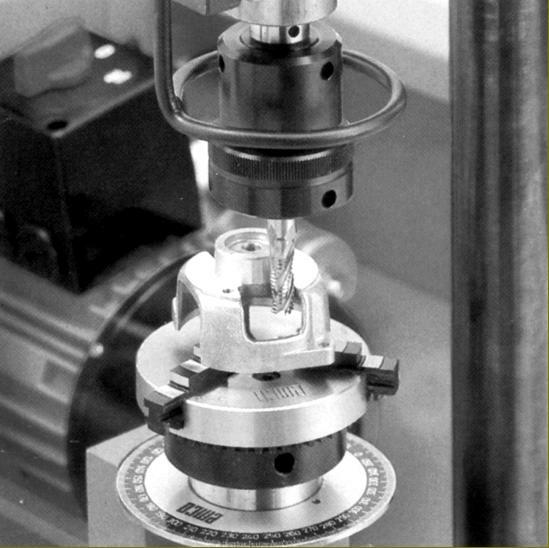 Morse taper socket and was equipped with a safe (though slow-to-change) "bolt-on" spindle nose flange. Driven by a 500 Watt motor, six spindle speeds were provided that ranged from 200 to 2400 r.p.m. on a 50-cycle supply and 250 to 2800 on 60-cycle (as used in North America). The speed range is pretty well spot-on for small moselling work, allowing larger casting to be turned as well as small pins. Able to be set over for the turning of slight tapers, the tailstock carried a 22 mm diameter spindle fitted with a No. 1 Morse taper socket. 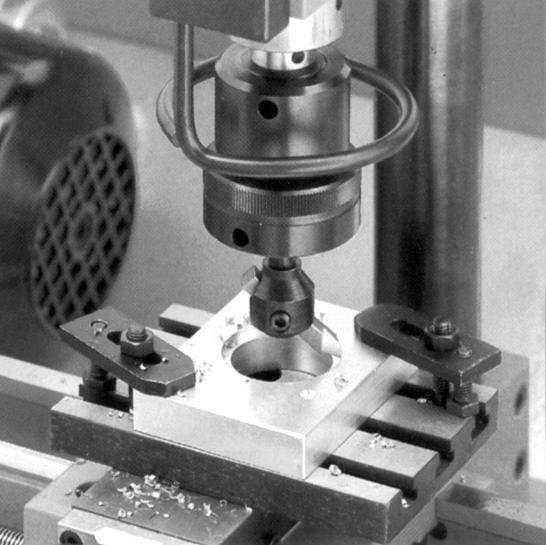 The usual wide range of factory-supplied accessories was available including (in addition to those already mentioned) a very useful if rather lightly-built power vertical milling and drilling head, 3 and 4-jaw chucks, dividing attachment, a T-slotted faceplate (also used as a "clamping plate" on the dividing attachment), T-slotted boring table, tailstock chucks and rotating centres, turning, threading and boring tool sets, a 2-way toolpost, quick-set toolpost, fixed and travelling steadies, top slide, splash guard and a collet attachment to take ESX collets from 1.5 to 14 mm. For the home workshop - especially one inside the hose or flat - the most useful addition is the powered vertical milling and drilling attachment; this bolted to the back of the bed and was driven (though a V-belt) by a 200 Watt motor that provided three speeds of 380, 700 and 1600 r.p.m. on a 50-cycle supply and 450, 800 and 1900 r.p.m. on 60-cycle. 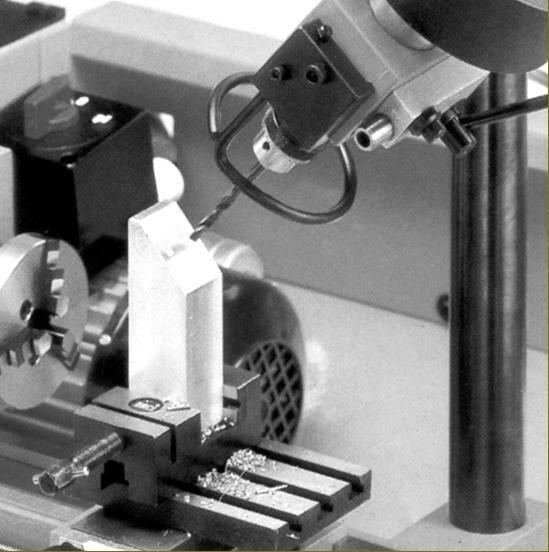 The maximum clearance between screwed spindle nose and the boring table was 200 mm, the working radius 82 and quill travel, by either quick-feed lever or an optional worm-and-wheel fine feed attachment, 30 mm. During the 1970s and 1980s the Compact 5, was marketed in the United States by Sears as part of their Craftsman range using the Model designation 549-289000 - this also being, unaccountably, the same number used on the Sears' version of the Emco Compact 8 when fitted with the Emco Compact 5 milling head…. 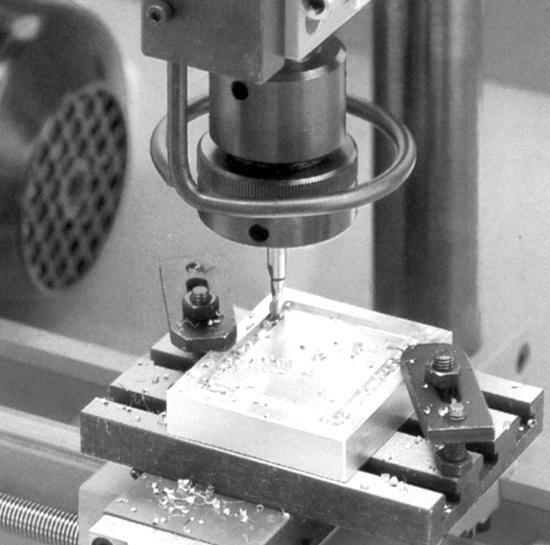 A CNC version of the Emco Compact 5 was also made..